Recently, auto storage has been in higher demand than usual. As many know, the law of supply and demand causes prices to inflate, but a self-storage facility many trusts throughout Tarrant County continues offering affordable auto storage. Give us a call at 817-413-3980 today! Better known as Blue Mound 287 Self Storage, this facility offers three different kinds of auto storage to better serve your needs. Here’s a scenario: you get home from work and park your car where? Most likely in the shade or in a garage if you have one. Why? You try your best to prevent long sun exposure for your vehicle and understand that having that added security puts you at ease. Whether you realize it or not, you are already taking auto storage measures. What happens when you leave town or even run out of space at home? Do you get rid of the car? NO. You find an alternative solution, you begin to consider leasing vehicle storage. Here at Blue Mound 287 Self Storage, we offer three different types of car storage to be better fit your needs. The difference between the three has a lot to do with more than just a price change. Below, we explore the three options a little more, to help resolve your storage needs. As always, our team is willing to help with the process and provide the best solutions. Our outdoor car storage provides a designated parking spot within our facility’s gates. Ideally, most people that choose our outdoor car storage option just need temporary or short-term storage space. These people are either moving, in-between leases or traveling for a short period of time. The added security at our facility makes people comfortable with storing their vehicle with us. We have security cameras throughout the property and tenants always have 24/7 monitored access. They are able to come and go as they please, not just during business hours. While this option tends to be the most “budget-friendly” car storage option for a short period of time, storing your vehicle outdoors without covered parking leaves it exposed to Texas weather. It is strongly recommended to use a high-quality car cover when choosing our outdoor car storage option to protect your vehicle. If you are needing long term storage, we highly recommend covered storage for you, including both, covered parking and a storage unit. Covered parking car storage is far more than just a price upgrade, it can also be used for RV storage or even boat storage. Our covered parking spaces are a lot wider and taller than our outdoor car storage spaces and of course, have a roof. These spaces are not inside of a building but are covered parking. A car cover is still recommended to protect your vehicle from dust, precipitation and more. We have different size options for you to choose from, depending on your needs and vehicle sizes. However, if you are still needing more protection, our storage units will be your best option. While we do not have “specific” units for car storage, we have solutions that work. Blue Mound 287 Self Storage offers storage units of all sizes, the 10 x 10 units (and up) can be used as car storage units. 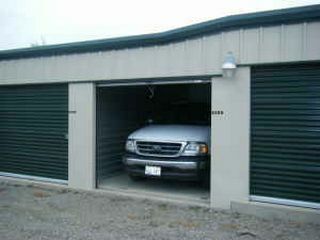 If you are looking for a garage space away from home, we have storage units as large as 20 x 30! You can easily work on that project, car or more. Our storage units offer maximum protection from extreme weather and natural elements. Climate-controlled storage units are also available to give you everything you need for your storage unit. We highly recommend using a storage unit for your vehicle if you are needing long-term storage. Our rates are based per unit as opposed to per car. If you are considering indoor car storage, we can find the solution that best suits your needs. Come in to our office or give us a call! It’s that simple!